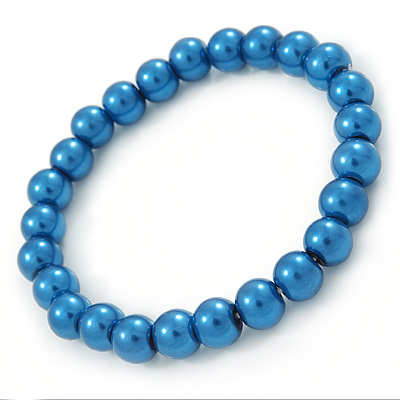 Complete the perfect look with this versatile 8mm Cobalt Blue Pearl Style Single Strand Bead Flex Bracelet. Featuring a single strand flex design, made of 8mm glass pearls in hues of cobalt blue. Flex design slides on easily for a comfortable fit up to 19cm. Orders of £ 30.00 and over are delivered free in the UK! Royal Mail First Class delivery for orders of less than £ 30.00 is dependant on the total wight of your item(s) and will be calculated at the checkout. Guaranteed next day UK and recorded UK delivery options are available at the checkout. We deliver world-wide using Royal Mail services. European and Worldwide delivery prices start at £ 2.77 and depend on the total weight of your order. Recorded and Expedited worldwide delivery options are available. Your exact delivery price will be calculated at the checkout. The more products you order the cheaper is the delivery per item. Please also check our delivery prices page. Returns: You may return this product for a full refund within 14 days of purchase date. Please follow our returns procedure to return the goods. Please refer to our full Terms and Conditions for the delivery terms. Avalaya is committed to high quality fashion jewellery and complete customer satisfaction. Every product that leaves our warehouse is checked for defects and manufacturing faults. Our products come sealed in a clear plastic bag, unless stated otherwise. We choose the best packaging and shipping methods to guarantee safe delivery of your order. Your Secure Shopping is guaranteed on this website. As our customer, you can relax and enjoy safe shopping experience on this website with peace of mind and complete confidence.